The biggest arguments against building the Rail Baltica rail link through the Baltic states have always taken the form of claims that it will not be worth it, as there won't be enough passengers or freight to make it economically feasible. The truth is that, while no one knows what the future will bring, forecasts do point a more optimistic picture. An analysis carried out by the professional services firm EY says that passengers will see the greatest benefits, as a high-speed rail link will be available in the Baltics for the very first time. For example, the journey from Rīga to Tallinn or Vilnius is to take just two hours with a speed of 240 km/h. Rail Baltica is to have seven passenger stations - Tallinn, Parnu, Rīga, Rīga International Airport, Panevėžys, Kaunas, and Vilnius. EY forecasts say that in the worst-case scenario for 2026, when the railway is to become operational, there would be 3.6 million trips taken in Rail Baltica and 5.5 million in the best-case scenario. Meanwhile by 2055 this number would have risen to 4.7 million trips in the worst-case and 7.1 million in the best-case scenario. EY thinks that Rail Baltica would lure passengers that are currently going by car. Likewise, this route would create tourism benefits as visitors could travel the Baltics by a high-speed train. In Lithuania, it is forecast that the Kaunas - Vilnius route would have the most passengers; the Rīga - Rīga Airport route would be the most popular in Latvia; and the Tallin - Parnu route would serve the most passengers in Estonia. A comparable increase in serving freight is not forecast for after the railway is finished, because there is little freight shipped between the north and the south in the Baltics. However, terminals in Tallinn, Salaspils, Kaunas and Vilnius are to be built, allowing to move freight from European to Russian gauge tracks. It is possible that freight trucks could also be moved with the railway. The EY report does, however, admit that, as a more economical way of moving goods, shipping by sea will still remain the dominant freight transport in the Baltics. The railway might instead compete with truck shipping. 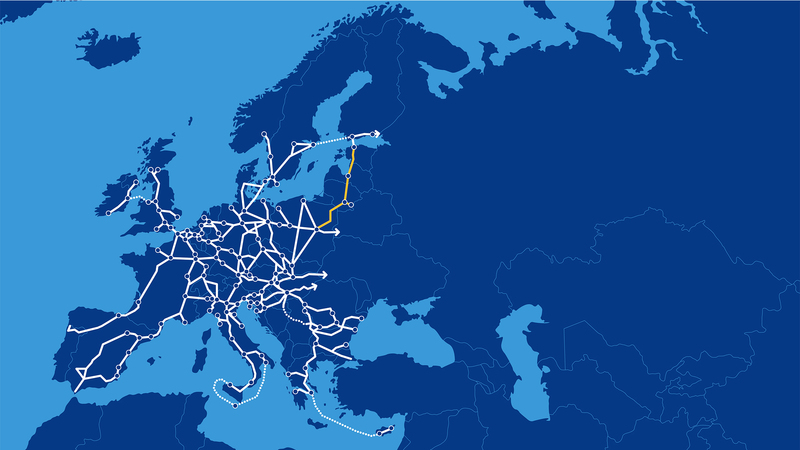 "The Baltics have to be connected to the rest of the European railway network. If we want to have a share of new freight flow, from China, as well as from Russia and other neighboring countries, it is a means of including the Baltics, Poland and Finland in the center of the game," said Katerina Trautmane, a representative of the European Commission in an interview with LETA late last December. While passenger vehicles remain the dominant means of transport, the number of rail trips is still growing across Europe, meaning the forecasts can still come true.